DAMASCUS (Sputnik) - Clashes are underway between units of the Syrian Republican Guard and militants in the Syrian town of Duma in Eastern Ghouta, there are casualties, a RIA Novosti correspondent reported on Monday from the scene. 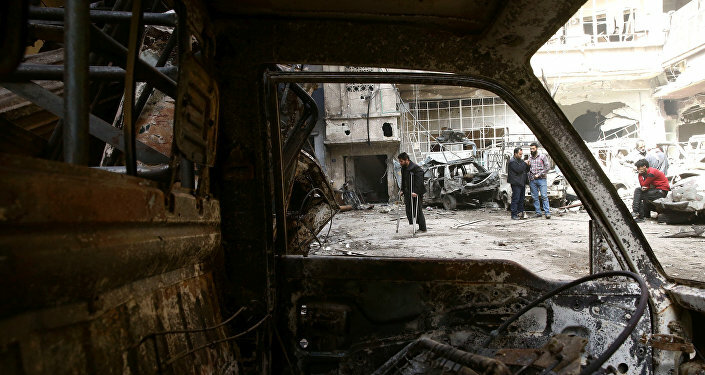 The fighting broke out at the Al Rahmani neighborhood. According to local residents, a large arsenal of militants was located in one of the buildings in the neighborhood before the town’s liberation. Several people were killed and injured. The development comes after the Syrian forces said that all the militants had left Douma, that was considered to be the last militant stronghold in Eastern Ghouta. Maj. Gen. Yuri Yevtushenko, head of Russia's Reconciliation Center for Syria, said that 3,976 militants left Douma by bus on Friday. He added that at least 67,680 have left the embattled Damascus suburb. The situation in Syria significantly escalated over the last few weeks because of an alleged chemical attack in Douma, located in the embattled Eastern Ghouta, reports of which first emerged a week ago. The European Union and the United States have blamed the forces of Syrian President Bashar Assad for the incident, but Damascus has refuted the allegations. The Russian Defense Ministry has rejected reports of chemical weapons use in the area of Eastern Ghouta, citing doctors from Douma who denied media reports about receiving patients with symptoms of exposure to toxic substances. Despite that, France, the United Kingdom, and the United States launched strikes on a number of targets in Syria in response to the alleged chemical incident.